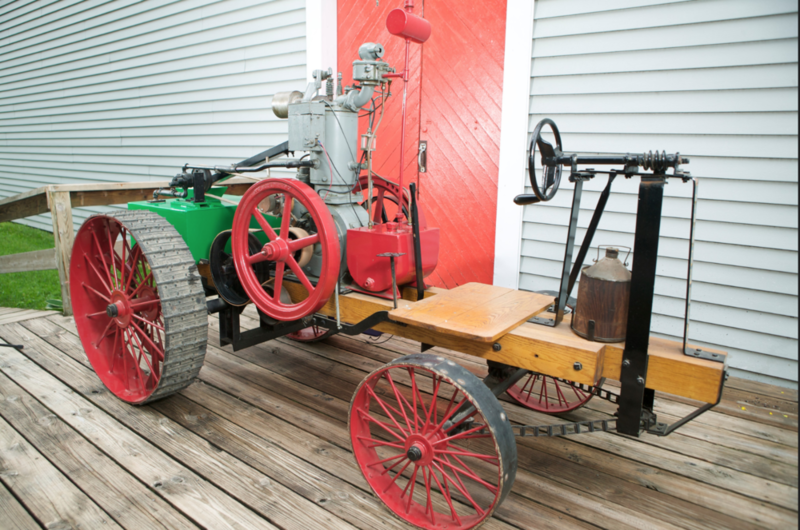 The Froelich tractor is considered to be the first gasoline-powered tractor, although that’s not entirely true. It also wasn’t a commercial success, so it’s interesting that it’s achieved such a reputation. Here’s the dimensions, specifications, and operation of the Froelich design as near as I can tell. Not the actual Froelich: this is the movie replica built by John Deere and used in their 1939 film Making Tractor History. The tractor was steered from a forward platform, without any seat for the operator. It seems to have been rather wide for just one person, given that there were important levers on either side of the platform. Steering was through a worm gear driving a spur gear on a long shaft. On the end of that shaft was another spur gear which meshed with a chain that attached to the front axle near each wheel. Rotating the wheel thus caused the chain to pull on one side or another of the axle: this axle and the steering mechanism came from the “Robinson & Co” and so is nearly identical to what you’d find on any contemporary steam traction engine. On the right-hand side of the platform was a second long-handled lever which was the shifter. Based on the lack of other controls and John Froelich’s 1917 patent for a “Reversing Gear and Clutch,” this lever had to operate as a clutch and gear selector. If we assume the mechanism was similar to his later patent, then it also provided braking. 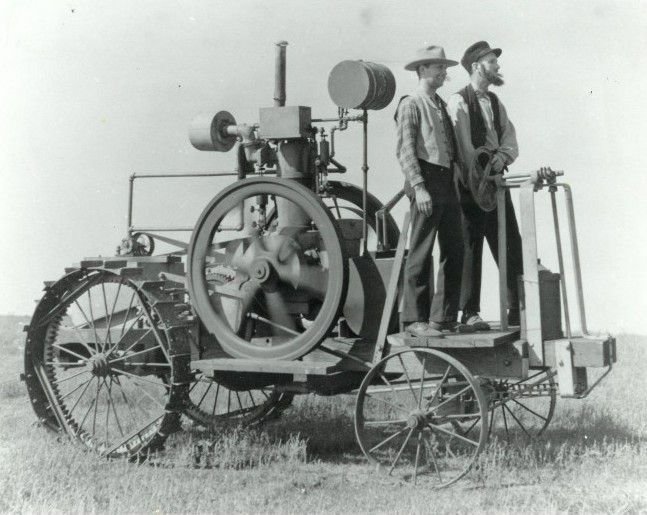 The Froelich tractor had at least a forward and reverse gear. There may have been two forward gears, one that allowed the tractor to reach approximately 2.5mph and the second that allowed it to reach approximately 3.5mph. 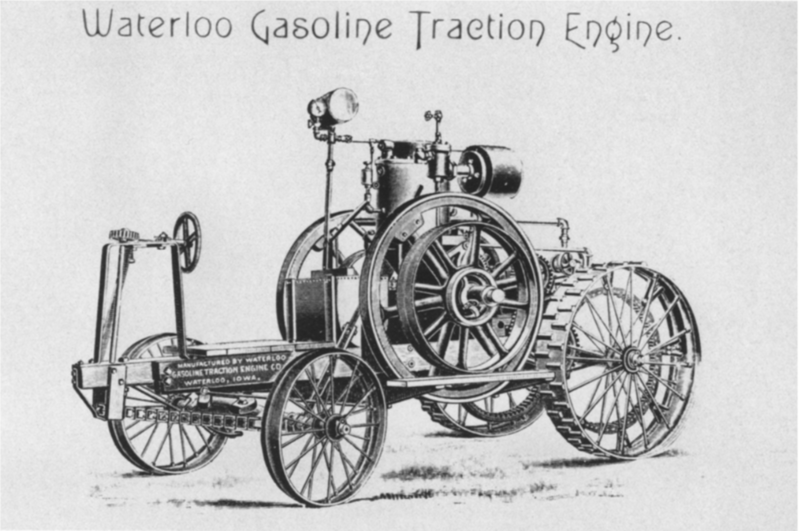 The Waterloo Gasoline Traction Engine Company advertised the two gears + reverse combination and it appears in some sources for the Froelich design but it could just be confusing the Froelich design with the later production version. Behind the operator was the main fuel tank. On top of it was a pump handle. As fuel injection wasn’t yet invented and gravity-feed the norm, the solution seemed to be that the pump handle would cause the gasoline to climb up to a reserve tank. 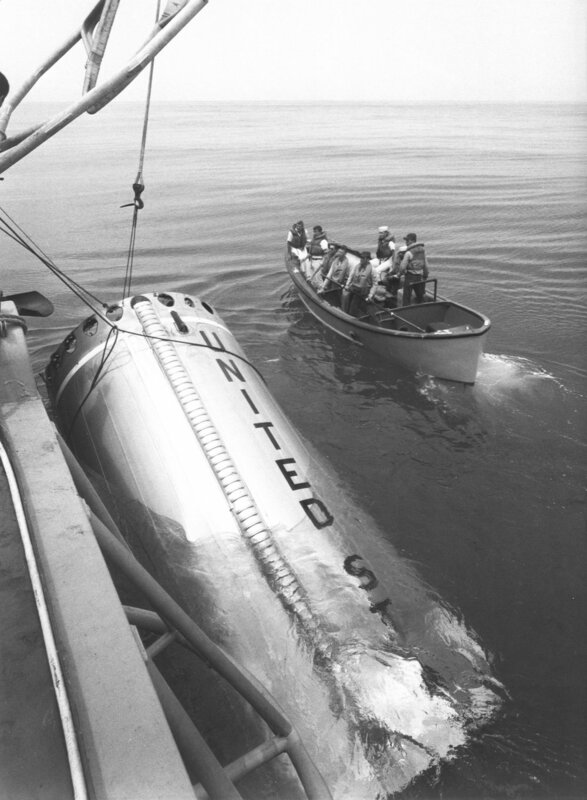 As suction from the engine pulled fuel through the line, the suction/siphon effect between the tanks and the engine would keep the engine supplied. The Van Duzen engine did use an early carburetor and ignition was via a hot-tube. via Ben Mueller, Waterloo Boy Tractors & Engines Facebook Group. The elevated “reserve” tank is oversized in this replica. Exhaust was probably routed through an early muffler, the squat horizontal cylinder seen behind the engine in some pictures resembles the one seen in this Van Duzen patent. Engine cooling was through a water jacket. The water tank was located at the rear of the tractor with a pump on top of it. 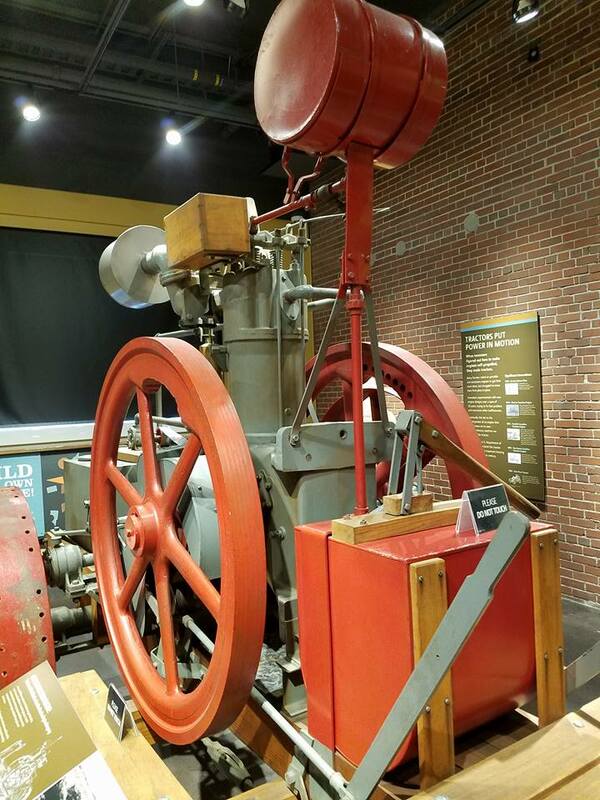 The pump was driven by a belt with the driving pulley attached to a geartrain taken off of the left side of the crankshaft with the axle crossing over to the right side of the engine housing. Some sources describe, and a single replica shows, an open channel returning water to the tank, cooling the used water by evaporation. Most replicas show a closed pipe return. The one-cylinder, 16hp, vertical engine was located amidships. It was manufactured as a horizontal stationary engine but supposedly shook apart two prototypes when it was mounted horizontally. The engine had a 14in bore and 14in stroke (for 2155ci displacement). The crankshaft and flyarms were partially exposed with a clutch on the crankshaft dis/engaging the belt pulley on the leftside. There were flywheels on each side of the tractor. A large driving pulley transferred power to a smaller driven pulley; the size of those two was different between the original Froelich and the later Waterloo production versions. The driven pulley transferred power into the transmission. The transmission is something of a mystery. I am convinced there were gears both between the chasis’ main beams and on the outside left side between the left wheel and the main beam. Given the controls, the emphasis on the engine’s ability to reverse, the otherwise lack of brakes, and Froelich’s later patent on a combined reversing clutch and gear, I suspect an early version of his design was somewhere in the transmission. The final drive was a long axle meshing with the sprockets in the wheels about at the widest horizontal point of the wheel. The final drive axle was either through the main beams or just below, and the main axle sat below those beams. It was another product of Robinson & Co. Both sets of wheels came from the same company. The John Deere Legacy by Broehl. Page 42 contains the following about the Froelich Tractor. I believe that he used or copied the Rumely steam engine transmission because Rumely was the only steam engine manufacturer to use a reverse gear; everyone else reversed the engine to back up. Just how the power was delivered to the rear wheels is not clear; however, a friction drive like that commonly used to drive thresher cylinders was utilized. This consisted of a compressed friction wheel on the powershaft of the engine that engaged a plain iron pulley on a driven shaft. The tractor mechanism differed from the thresher mechanism in that a spring held the mechanism out of engagement, and to start the machine as a tractor, the operator at the steering wheel rode with one foot on the end of a long lever that forced the friction wheels together. This passage caused me considerable headache while researching the Froelich tractor, as there is very little written about the Marsh valve gear the Rumley steam traction engines used—as documented in my other post, this forum, seen in this video, and subject to this patent (and this one). It took a while to realize that Broehl should not be considered a reliable source when it comes to the Froelich tractor. The Rumely steam traction engines of the time did not use a reversing gear train but the use of the Marsh valve gear also reversed the operation of the engine just like other steam traction engines. It is also the only source I have found to claim that the main beams were laminated to “bend together at the front over the front axle, while at the rear they were spread out practically…parallel to each other” (42). None of the replicas nor period sources seem to show the main beams bending. Reversing a steam engine requires reversing the operation of the piston. Unlike with an internal combustion engine, the piston is powered on both the “upstroke” and “downstroke.” On the upstroke steam is injected behind the piston head and once it reaches top dead center, steam is injected in front of it, driving it back to bottom dead center. Thus to reverse the piston, it’s stopped wherever it is in the cycle and steam injected on the side opposite where it was last injected. Injection is controlled by the “valve gear.” Below is an animation of the Walschaert valve gear common on steam locomotives, in both forward and reverse. Below is a very rough animation of how the Marsh valve gear did the same. The system was actually relatively simple: the valve gear’s crank rod was tied into the motion of the piston via a drivetrain, which drove two spur gears with the valve gear crank rod attached to the latter. Both spur gears were mounted on a lever that could rotate around the axis of the drive train they were attached to. By rotating the lever so that the end of the crank rod was either above or below a horizontal plane extending from the center of the drivetrain axle, the valve gear crank rod’s motion would change, thus reversing the valve gear. The details of the transmission on the Froelich tractor are a little hazy. In John Deere: A History of the Tractor by Randy Leffingwell, he references a “sliding gear transmission” (p70). The accompanying picture is of the Froelich museum replica, which has some accuracy issues, so it is difficult to assess the accuracy of the claim. Morland, Andrew. Legendary John Deere Tractors. p10. by Ben Mueller, Waterloo Boy Tractors & Engines Facebook Group. The care shown in arranging the, apparently, faux shifter has me convinced there is some truth to it. Since the transmission appears incapable of shifting, I am convinced the accuracy is actually for the shifter, not the transmission. This correlates well with the use of a brake band dwarfed by a larger flywheel on a 1917 patent by John Froelich for a “Reversing Clutch and Gear.” However the all-internal gears are difficult to reconcile, accurately, with the mix of internal and external gears shown on the Waterloo and Ertl designs. Broehl should not be considered a reliable source when it comes to the Froelich tractor, however. It is the only source I have found to claim that the main beams were laminated to “bend together at the front over the front axle, while at the rear they were spread out practically…parallel to each other” (42). None of the replicas nor period sources seem to show the main beams bending. In addition, the Rumely steam traction engines of the time did not use a reversing gear train—they used the “Marsh” valve gear as documented in my other post, this forum, seen in this video, and subject to this patent (and this one). The Waterloo Gasoline Traction Engine Company (incorporated to produce the Froelich design) advertised two forward gears and one reverse. It’s unclear if the original had three gears or just one forward and one reverse. 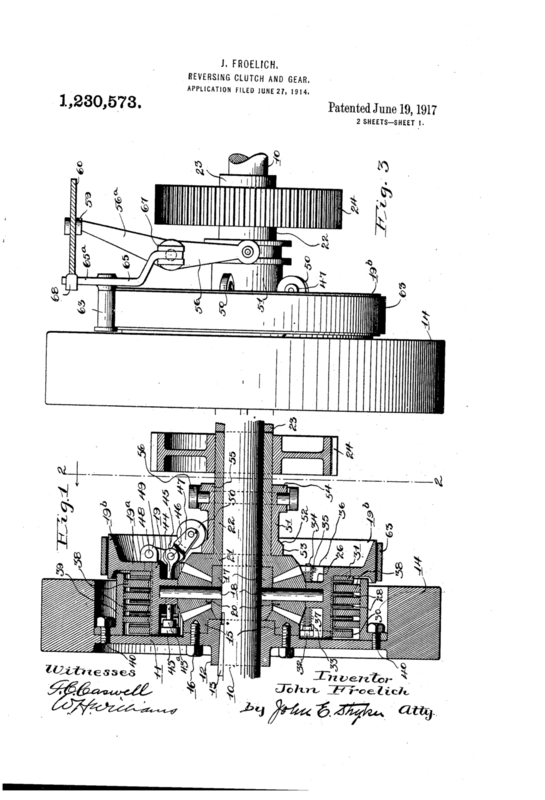 Submitted in 1914 and approved in 1917, John Froelich received a patent for a combined Reversing Clutch and Gear. 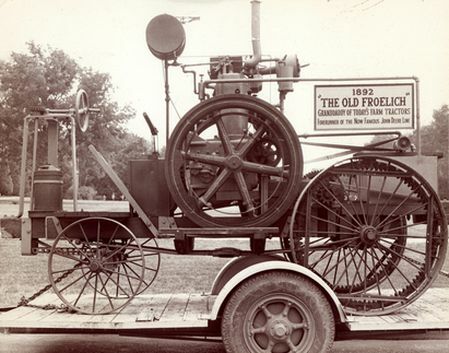 This is over a decade after he left the Froelich company but it operates with a band brake, single control, and provided both a forward gear, reverse, and neutral/brake. That makes it a good candidate for inclusion in the Froelich’s transmission since there’s no clear braking capability on the wheels, only a single lever for controlling the transmission, and the advertised capability to travel both forward and reverse. The basic operation of Froelich’s reversing clutch and gear was rather complex. It comprised an input shaft tied to a large flywheel. As the shaft and flywheel turned, they were tied to a bevel gear such that it had no motion relative to the shaft and flywheel. In turn the bevel gear meshed with a set of 4 pinion gears that could both rotate on their own axis or rotate around the input shaft. These 4 pinion gears meshed with another bevel gear tied to a hollow shaft that encircled the input shaft, such that the encircling shaft could turn independently of the input shaft. The encircling shaft was tied to the output gear such that the output and second bevel gear always rotated together. Neutral: If the output gear was held in place, like by the inertia of the wheels, the 4 pinion gears would revolve around the input shaft instead. Forward: The pinion gear were attached to a hub that nested inside the flywheel, which could be held in place by a band brake. Thus activating the brake band would force the pinion gears to stay in place, and instead revolve around their individual axles, so the input bevel would rotate, the individual pinions would rotate the opposite direction, and the output bevel would rotate in the original direction of the input. Reverse: A shipper surrounding the encircling axle and the input shaft could be used to compress a series of clutch plates inside the flywheel and hub. This would thus link the flywheel and the hub so that the pinion gears were tied to the input bevel. The revolution of the input bevel was linked to the pinion gears at that point, so they acted as a single gear turning the output bevel in the opposite direction to the input bevel. It’s understandable why Froelich’s design didn’t proliferate. While clever, it has lots of small parts that probably weren’t particularly durable. Manufacturing it would represent a challenge since it needed those small parts threaded together carefully. Despite its much later patent date, the inclusion of a band brake and presumably nonfunctioning shifter on the movie replica incline me to believe that Froelich’s reversing clutch and gear were used in his tractor (or an early version at least). It could be extended to have two forward gears by increasing the length the shipper could move, which may explain why some views and replicas show a large number of gears in the drive train. Its single control lever and ability to enter neutral/brake all match the Froelich tractor’s lack of visible brakes and other controls. One of the challenges in researching the Froelich tractor is that there is a scarcity of primary sources (especially graphical ones) and a proliferation of information that seems to be based on some of the much later replicas. Below, I try to sort out some of the differences between the most important examples of the Froelich design. I’ve chosen five exemplars of the Froelich design based on how I perceive their significance in propagating information about the original. A group of examples can be ignored fairly easily: most running “replicas” are not replicas in the strong museum sense (that is they are accurate to the point of serving as resources) but more like “mock-ups.” If it features a roller chain or doesn’t have multiple exposed gears, it’s not especially accurate. 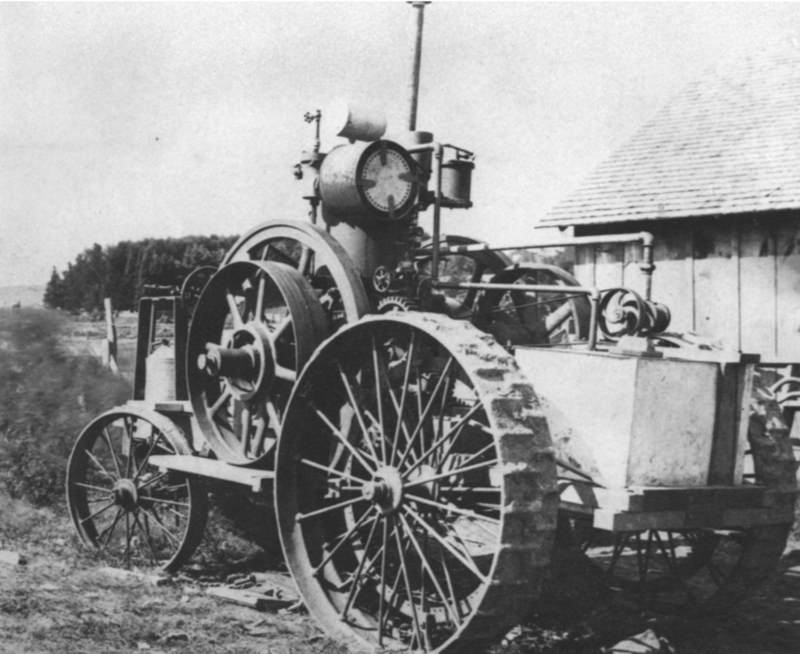 In the group above, there are three pictures labeled “Froelich” which almost certainly show the original tractor. 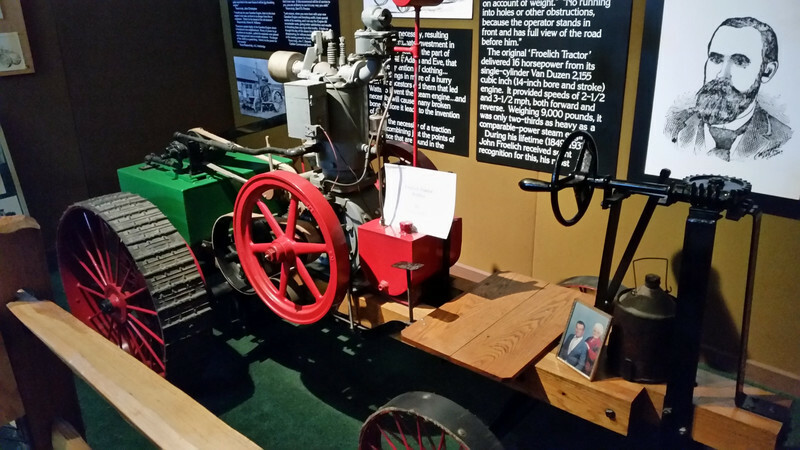 The pictures labeled “Waterloo” probably show a Waterloo Gasoline Traction Engine. The group labeled “Ertl” show a 1/16th scale model which could be based on either the “Waterloo” or the replica shown in the group labeled “Movie,” used in John Deere’s 1939 film Making Tractor History and on display at the John Deere Tractor and Engine Museum. “Replica” shows a 1/2 scale production that resides at the Froelich Tractor Museum. The “Waterloo” pictures show an advertisement, the picture the advertisement is literally drawn from (you can see the artist’s manipulation already), and a rear 3/4 view. The “Waterloo” is distinguished from the “Froelich” by the engine belt: in “Waterloo 3” you can clearly see the driven pulley is quite large (which is confirmed by the design of the “Ertl”) while in “Froelich 1” and “Froelich 2” you can see the driving pulley is the large one. Another possible distinguishing feature is the pump handle: it may be different than the one seen in Froelich 3. You can see a lubricator between the rear of the fuel tank and the belt pulley—it’s the spool-shaped object in the triangular light patch. Examples of these can be seen in the Van Duzen restoration thread linked above. It’s more evidence that the engine housing is not solid like what is seen on some of the other examples. Between the differences from the “Froelich” pictures and the inclusion in Waterloo advertising, I’m convinced this example is a Waterloo Gasoline Traction Engine. “Replica” also seems to have been built to run, although the museum uses a different “mock-up” for actual use. Accordingly, its engine structure is very different than the others. It also has a transmission located between its main beams, lending credence to the idea that the “Froelich” transmission was of this “internal” type. The water tank (green) is supported oddly, and uses an open channel to return water from the engine’s cooling jacket. There are mentions of this method of releasing heat from the used cooling water in a few sources but I don’t know which came first: these references or the “Replica.” The water tank is also supported in an unusual fashion compared to the “Waterloo,” “Ertl,” and “Movie” designs. The “Replica” design could be an outlier or it could be true to the “Froelich” design, as I have no clear sources for what the rear of that one looks like. However, there is no mark corresponding to the large channel on the source images for the “Froelich.” The timing gear on the engine shows some differences, which were probably necessary for a working engine (compare “Replica 5,” “Waterloo 2,” and the Van Duzen restoration thread). “Replica 1” also makes it quite clear there’s no pump handle on the gasoline tank, the right hand lever is some sort of pedal, and there is an additional lever between the main beams (perhaps a shifter). In all, none of the later sources are entirely true to what the “Froelich” would have looked like. The most accurate is the “Movie” design, but The transmission is incorrect: it would not be able to shift, and should have a set of spur gears on the outside of the beams and a lower final drive axle. Having failed to find the unit cost of Grumman's F11F Tiger in any established sources, or to find any budget documents that listed the cost, I conducted the investigation myself. The result—an F11F Tiger cost about $950,000 in 1954 (equivalent to $8.6 million in 2017) although each Tiger could have cost as much as $1.02 million in 1954/$9.3 million in 2017. A Wall Street Journal story from October 29, 1954 sheds some light on the orders. It states that Grumman had received a $164,587,184 contract from the Navy, and "more than $150 million of this represents production orders for the company's new F9F-9 Tiger supersonic carrier fighter" (early in development, the F11F was treated as a new version of the F9F, which is why the name doesn't match). Later, the article adds "Grumman Aircraft said the more than $150 million for the F9F-9 Tiger jet fighter was new, and was in addition to a $40 million earlier initial order announced for this aircraft." The article is linked in full here. This establishes at least two orders for Grumman's Tiger: one worth $40 million and another worth between $150 and $163 million. Thus, production of the F11F Tiger cost at least $190 million. The number of "units," or airframes produced, is also nebulous. Wikipedia, without a citation, indicates 200 aircraft were made. Greg Goebel's excellent Air Vectors site might agree. He notes that there were changes on the production line starting with the 58th Tiger produced and shortly after notes there were 142 more F11Fs made before the order was cancelled. Together these numbers imply 200 were made. However, he also notes there were two prototypes, an order for 42 evaluation/initial production aircraft, and an order for 388 production Tigers with another 85 modified for reconnaissance. Joe Baugher's list of serial numbers indicates batches of 44, 252 and 134 serial numbers were reserved for the F11F for a total of 430. Of that second batch, 95 airframes were cancelled. All of the third batch was cancelled. None of the 82 serial numbers he lists for the reconnaissance version (The F11F-1P Tiger) were built. Altogether, this leaves serial 44 + 252 - 95 serial numbers: or 201 machines built. If 200 or 201 aircraft were built, with a minimum production cost of $190 million, this would result in a cost of $945,000 per Tiger. The $40 million contract mentioned by the Wall Street Journal probably referred to the 42 evaluation/initial production Tigers—plus or minus the two official prototypes. That comes out to $950,000 or $900,000 per F-11 in the first contract, and $960,000 - $1.02 million for the latter contract. Intentionally controlling the results, the "more than $150 million" could have been $151,000,000 to make the cost of each Tiger in the second batch the same as the $950,000 cost of each Tiger in the first batch. A figure between $900,000 and $1.02 million isn't a bad estimate. An F-100D Super Sabre (of similar size and power) cost about $697,000. However, it was produced in larger numbers which can reduce unit costs because the company does not have to charge so much to recover the money the spent developing the aircraft, and the Super Sabre was not aircraft carrier capable which requires a heavier build. Plus, Grumman's Tiger was replaced by the F-8 Crusader which had a unit cost of $1-2 million. Be sure to check our blog proper if you don't see what you're looking for! When the news broke that an aircraft had crashed near Area 51, it set tongues wagging. What could the classified aircraft have been? Why did the military wait several days to announce the crash? Since the test pilot who was tragically killed had experience in the F-35, people were quick to wonder if that troubled program had just run into more trouble. The Air Force was willing to dispel the last notion, adding that it wasn’t an F-35, perhaps to avoid any more bad press for the program. That announcement successfully shifted the narrative to two points: first, the incredible life of Lt. Col. Schultz, the test pilot flying the aircraft and second, what he was flying. Most rundowns have focused on known aircraft, and rightly so. Any speculation on unknown aircraft has far more room and far more risk to become ungrounded in reality and, ultimately, very little reward as it could be decades before there is confirmation of the type, if any. Also, if the Air Force is not being disingenuous in its announcements, Schultz was flying at 6PM. At that time, on that date, the sky would have been light. Deep black programs at Area 51 typically fly at night, and may even avoid moonlit nights to further deter sightings. September 5th was only a few days after a full moon. Thus whatever aircraft Schultz was flying, it was acceptable to fly during daylight or dusk hours. This probably indicates an airframe that, while its use was classified, is not unknown to spotters. The USAF might not acknowledge having the craft, for one reason or another, but it is rightly suspected to exist or has been previously seen. Hence, suspicion has focused on several aircraft right away: the F-117, the Su-27 Flanker, or a test article associated with the B-21 Raider program. The last has only been seen in model and concept form, although the sighting of mysterious flying wings fuel speculation that it has been partially seen. Ignoring the Area 51 hype and focusing on an aircraft with a semi-classified history with the Air Force and which represents an extremely likely threat brings another aircraft to light: the MiG-29 Fulcrum. The Air Force has had experience with the type via post-unification Germany. In 2009, Phil Drake, an aircraft spotter, photographed a MiG-29 and F-16 training together near Groom Lake. Tellingly, the United States purchased 21 of the MiG-29S version from Moldova, which have mostly disappeared into various laboratories and other exploitation centers. Schultz had experience flying both single-seat aircraft (the F-35) and double-engine aircraft (the F-15E), so a Fulcrum is not out of the question. The Air Force claims he was on a training mission, which would be expected with familiarizing himself with the foreign aircraft. Further, after this article was written, rumors appeared via Aviation Week that Schultz was the leader of the "Red Hats" squadron who are suspected of operating foreign aircraft. This supports the idea that he was flying a foreign aircraft, and, if he were flying a training mission with a familiar airframe but classified payload the Air Force would have no reason to classify the airframe unless the payload were indicative of only one type of aircraft. Why should we suspect the plane in question is specifically a Fulcrum? Because North Korea not only operates the aircraft, they operate the export version of the MiG-29S. These MiG-29SE are suspected to be based out of Sunchon and, at times, Onchon or Kwail. As the image below shows, a basic combat radius of 444mi allows these bases to cover all of North Korea. Assuming loiter and prep time decreases that radius, but they could still cover Pyongyang (the red star), Yongbyong (North Korea’s primary Nuclear Facility, the black icon), and several known missile launch sites (yellow icons). The radii for Sunchon’s aircraft are shown in shades of blue, those for Onchon’s aircraft in grey. Animation: MiG-29 combat radii from Onchon, MiG-29 combat radii from Suchon, MiG-29 combat radii from both compared. These aircraft are the most potent in North Korea’s Air Force. Aided by ground radar like the P-18 (chosen here because of its role in downing the F-117 over Serbia), whose detection range is shown in red, they would present quite a gauntlet to intruding aircraft heading for high value targets. If a B-2 flying along the yellow path were detected at maximum range, it would have 20 minutes before reaching its target, never mind exiting the airspace. For the F-22 at maximum Mach, this is closer to 10 although it also risks detection by the MiG's IRST. For the former, an encounter with a MiG-29 vectored by ground radar is a nightmare; for the latter, a hairy distraction which could imperil a sneak attack. The United States acquired the technical details of the Fulcrum’s original radar, but North Korea’s MiG-29SE operate the replacement to the compromised system. Plus, theory doesn’t always match experience, so operating a MiG’s radar could, all these years later, still produce useful information. This is especially true if it’s being tested against an airframe that didn’t exist when the imported Fulcrum’s was tested. Schultz may have been flying an imported MiG-29S to assess its capabilities against various stealthy systems that could be discreetly flown from Nellis Air Force Base (F-22s or F-35s), Tonopah Test Range Airport, or Groom Lake (B-2s, F-117s, the flying wings, etc). That Fulcrums are still operated is classified, hence the Air Force’s response, but they have been sighted and the Moldovan examples’ dispositions tracked, so it would be acceptable to train in the daylight. Schultz's position (100 miles northwest of Nellis) puts him close to Groom Lake, fueling the Area 51 speculations. It also puts him close to another feature of interest: the “Korean” airfield on Tonopah Test Range. Besides having a design similar to Korean airports, there is a supposedly operational S-300 SAM system located there. While North Korea does not operate the S-300, they do operate the S-200 and an indigenous SAM that is potentially related to and suspected to be on par with the S-300. This setup (S-200s and S-300s on the ground and MiGs overhead) would partially simulate the overlapping air defenses of the Hermit Kingdom. Additional observations could be taken by Groom Lake and Tonopah’s various radars and ECM systems to help refine an attack. Attack on what, though? Given the Trump administration’s rather schizophrenic statements on the use of diplomacy in disarming North Korea; the threat of reliving “Scud hunting” with road mobile ICBMs in North Korea; the devastation that would result from a ground war; China’s resistance to American troops coming north on the Korean peninsula; and the US’s practice of “decapitation strikes,” then the simulated attack would probably be on North Korea’s command structure if not Kim Jong-Un himself. With a President who may favor action over talking anxious to see North Korea’s nuclear program “solved,” it’s not unreasonable to believe that planners would respond to presidential pressure by suggesting that toppling Kim Jong-Un would collapse North Korea’s willingness to use those nuclear weapons without the risks of all-out war against a nuclear state capable of threatening allies and the homeland—it’s also plausible to believe that there are exercises practicing just such scenarios on a regular basis. F-16 (front) and Su-27P (rear) simulating intercepts in Nov 2016 near Groom Lake, via Phil Drake. Click for original. All this is a dark assumption for why a MiG would be operating near Groom Lake, seeming to presage war or indicate a strong willingness to make it. Perhaps Schultz was flying an Su-27 in routine exploitation testing. So far commenters appear to favor the Su-27 as it was spotted most recently (2016 vs 2009), but since Flankers are legendary in aviation circles it is hard to imagine this hasn't biased that theory. There could be cooperative work with Ukraine going on at Groom Lake, where the Red Hats fly Flankers against Fulcrums flown by Ukrainian pilots as a half-way step to arming the Ukraine. Both that theory and the theory that Schultz died flying a MiG-29 in support of a program assessing stealthy aircraft’s vulnerabilities against a North Korean-esque air defense system as they practiced a decapitation strike has the benefit of being timely with current events, but which is correct will have to wait until the USAF finally, if ever, says more. When I graduated college with my philosophy degree, I was lost. There was nothing I would have rather studied, but the doubt my education had instilled in me was crippling at times. Even without a penchant for Nietzsche and Heidegger's existentialism, there was doubt to be found in the proliferation of competing systems of philosophy and the lack of application those systems found in the "real world." I could stay close to this "real world," a frustrating and messy place, or enter academia, a different kind of frustrating and messy place. Even changing myself could seem fruitless given that I would almost certainly never stay fixed and that time and the people around me would slowly alter what I thought, how I felt, what I believed. I'm sure this post-college wandering is normal. So far, mine has brought to the Hutchinson Public Library (with plenty of places and stories before that!) and, since then, to weeding out the philosophy books at the library. There are a lot of them, and many of them are "personal philosophies." I'm reviewing great works I know, learning of good works that have been overlooked in my education (partially by necessity), and trying remove quite poor works. Can I access that which makes things true? Does it matter if I can't? Do I know what is right and wrong? What is the criterion or criteria? Is what is right objective? How can I convince others what is right and wrong? Do people really respond to logic and evidence? Does it matter if they do not? Does anything I do really matter? What does it mean for something to matter? How can I know a theory I hold is sound when there are so many competing theories that could be sound instead or as well? How can I account for all competing theories? Does the publishing (both academic and general) process really work to find good theories or just ones with specific gains to the publisher and the (usually well-meaning) author? Go ask Alice. Anyways, as an embodied agent (that's a belief, although relatively uncontentious) I exist (another belief, although maybe necessary) in a specific time (probably contiguous with previous memories) with existing beliefs (that's either necessary or sufficient for persons) that are probably somewhat continuous. I also have limited time and ability (probably physical necessities) and existing obligations (which may or may not be necessary), thus I cannot learn everything that may be needed to dispel even some of my doubts. But this isn't the end of the story. Thanks to how philosophy is often written, reading it exposes us to other thinkers that both agree and disagree. Some of the best philosophy exposes us to psychology, sociology, anthropology, literature, statistics, physics, biology, and more. My argument is simple—not only is it acceptable to read in support of what you know, it is good so long as you do not do so exclusively. First let's start with a relatively easy step. You are an embodied agent. You exist (now) with physical and mental limitations, some of which cannot be overcome. To one degree or another, you will always need food and water, air, sleep, and a suitable environment. You will probably never be able to remember everything. You probably cannot read faster than a certain limit. This is to say nothing of certain mental health requirements like socializing (for many). These physical and mental limitations cause a further temporal limitation—because considering theories requires time and because your physical limitations require time of their own and because your mental limitations either require time of their own or cause you to expend more time considering theories and because you will not live forever and because new theories are generated often, you cannot consider every theory in your limited time. And by considering, I mean thinking about (fastest), reading (probably slower), or talking about and listening to (probably slowest) theories. Having established that you cannot consider all theories regarding your doubts because of your embodiment, which theories should you consider? None? The most "important?" The most "famous?" There is that nihilistic bent that says none need be considered because none matter. Of course, that is a theory on its own, so it can occupy an awkward position of arguing that no theories regarding what we doubt matter except for the theory that no other theories matter. I think it might be defensible, but it should not be adopted with any less consideration than it devotes to arguing against other theories. There is also a bending towards ignorance that says none need be considered because you can live without them either by acting automatically or by following convention. If you accept either of these, I doubt you would be reading this. Both are open to consideration, and may stand or fall together given how you came to act in the ways you find automatically are probably influenced by convention. If you (probably) believe it is worth considering different theories to assuage your doubts, but cannot consider them all, that leaves our nihilistic "none" need be considered or that at least some do. But which ones? Something quantifiable would be helpful, like the realization that the more cited a paper is, the more important or useful it is. Granted, it could also be more controversial. Establishing a quantifiable way to determine which theories merit consideration is not inherently bad, although it comes with the same pitfall that not establishing one would: a dark horse theory or work, which is revolutionary and overlooked or which you can connect with may not surface. If a quantifiable method works for you, and exposes you to new theories, good. For many though, I suspect that is a little too machine and you, the reader, a little too human to keep up with it. If you read what you already know and read what connects to that, you are more likely to ensure that you are reading what connects with you, for one reason or another. In addition, you're going to move, step-wise, through theories. Assuming that philosophers cite works that argue against them and reference works that argue with them, by following the latter, you're going to discover theories with a high degree of initial similarity, but which diverge enough on some details to merit the later author writing a new work. Not all positive citations will lead to theories with a high degree of similarity, as broad agreement is often valued in philosophy, and not all negative citations will lead to theories with a high degree of similarity either, but these are the same chances you would take by jumping from the one highly quantifiably ranked theory to the next. The same chance of dark horses exists as well, but the nature of a dark horse is such that missing it is always a risk. So, since you cannot consider all theories that would reassure you of your doubts and since following the references in philosophy papers is likely to reveal connected works, the next step is to start. Start where? Where you are familiar, is my answer. In my list of mental limitations I did not include "interest," or "motivation" but those are also important ones. Your interests are probably not all expansive. Some things motivate you more than others. While discovering new things can be exciting, you also probably already have a sense of ones that motivate you. If interest and motivation are limited, especially more so than a broad desire to "know," than an efficient distribution of your motivation could be important in helping you walk through all of the theories that you can consider. And since the theories that have interested you in the past are likely to reference closely connected theories, you have a place to go after you start, and since you can't read all written theories, this gives you a natural criterion by which to choose. Especially after the 2016 US Presidential election, echo chambers, where your beliefs are amplified and reinforced to the exclusion of competing beliefs, have become an important consideration. If you read what you know and use that to find more of what interests you, will you build a coherent set of beliefs that excludes any possibility for revision? It's possible under almost any circumstances, short of living with crippling doubt, that you hold beliefs you will not revise. Even if you don't realize it. Still, you have a fighting chance so long as you're 1) continuing to encounter works that reference other works and 2) actually reading works that challenge your own theories. (1) because it holds the works you're reading to a certain standard that, hopefully, keep their assertions grounded, or at least, allow you to verify them. (2) because it increases the odds that if you encounter something truthful but counter to your own theories the exposure will not merely reinforce your own beliefs. Now, it's easy to observe that upon confronting an uncomfortable fact, people will reinforce their existing beliefs even if they are being proven wrong by said fact. You need only watch people to see this. It is also discussed in psychological studies. How do you prevent the effect from closing yourself off from the truth when you encounter an uncomfortable fact that negates your own theories? There is probably no easy answer, but my personal theory is that if you are encounter works that reference other works and you seek out the works referenced, you're going to encounter works critical of what you know. To soften any psychological resistance to countervailing facts if you follow a reference that is critical of a theory you find agreeable, perhaps don't read it right away. Instead, read the critics of that reference first. Although they may not be criticizing the original critic from a position you find agreeable, they might do so from a position that you are not as strongly opposed to. Even if you find the critic's critic despicable, the separation between what you were reading out of personal interest and the criticism of that means there is little risk you'd have accepted the critic's critic's position under other circumstances and are now merely resisting it out of hostility towards facts counter to what you believe. Still, one must try and move forward with an open mind when reading criticisms. So you're an embodied being, with a life constrained by different limits and probably without the time to sort through all the competing theories about life and its details that exist. Maybe the fact there are all these competing theories even fills you with a paralyzing doubt that makes you suspect none of them can be worth reading, or that if some are, you are unsure which to read. It's okay though, because if you read works that reference other works, and start with the ones you know, you're going to be entering into the web of human knowledge, tied together by infinite connections. So long as you keep following those connections, keep thinking, keep asking, you'll be pulling on the threads of all of human knowledge on a search which binds us all together. A work in progress list of all manufactured Redstone missiles, their serial numbers, and disposition. Thanks to Rusty Barton's own list (no longer available) for getting me started. N760H was definitely purchased through Olive's business agreement with Morane-Saulnier [Mike Jerram, General Aviation]. Her first owners? Henry and Louise Timken, who I know from railroad fame for inventing the tapered roller bearing [Demonstration Locomotive]. The two took turns piloting her, holding onto N760H into 1969-1970. A Neil Cargile became her owner at that point, and the Timkens bought a Learjet [Alex Kvassay, Professional Pilot Magazine, Geoff Goodall]. Louise Timken with N760H, date unknown. Via Alex Kvassay. N760H at an unknown location, date unknown. Screen capture of scan of slide from an expired Ebay auction, unknown seller. N760H painted as she was when she was with the Timkens. Unknown location, June 1962. Archived here, click for Ebay store. N760H at an unknown date and unknown location, by G. Bouma via Joop de Groot, click for original. The file title suggests this could be 1964, which would be a credible date given that her paint has changed since pictured in 1962. Neil Cargile was a man with a colorful life. He had learned to fly in the US Navy, and he was known for appearing at clubs with his girlfriend while they were both in gowns. He ran a mining company by day. His most noteworthy news appearances happen after N2NC née N760H passed through his hands. From the Hattiesburg American, June 19, 1979. N2NC had been sold two years prior. N2NC probably would not have handled an unpowered highway landing well. From The Sunday Tennessean, April 1, 1990. Palm Beach Post, August 3, 1995. In 1973, N760H had become N2NC which became N2TE in 1981, then XB-FJO in 1990 while registered in Mexico, before returning to the US as N2TE in 1996. Those in-between times are hard to follow. She would crash that year, sadly killing three people whose lives merit stories of their own. At the Santa Monica Airport (confirmed by the sign over N776K's port wing). From San Diego Air and Space Museum Archives. At the Santa Monica Airport (confirmed via Saint Monica Airport History pictures, this is the Aero Commander Building, ironically next to the Lear building) in February 1961. Via Ed Coates. Mr. Keeney was a pilot for United Airlines, which explains why he was comfortable buzzing an air base 100 feet above the runway at 400 knots upon a request to show off the foreign aircraft [Santa Barbara City Directory]. From the Oxnard Press Courier, February 4, 1961. Mr. Keeney featured in an ad in the Oakland Tribune, July 16, 1957. After Mr. Keeney, she was reregistered as N760C to a Sherwood Johnston of Scottsdale, Arizona. I can find very little on her starting at this time, except perhaps that the Johnston's were quite the socialites. From the Arizona Republic, June 21, 1967, after N760C had changed hands again. In 1966, N760C was rechristened N760S. Under this designation she passed through quite a few hands until she landed with her current owner in 1986 or 1993. I say either because I have a sneaking suspicion that J & B Inc of Washington DC and B Air Inc of Alexandria VA are really owned by the same person. In this guise, she's made appearances in Fort Lauderdale, perhaps on simple jaunts or for the owner to winter there. Her last appearances were in 1991 and 1993. N760S at Fort Lauderdale Executive, October 8, 1990. By Simon Brook. Of the four Paris jets Beechcraft had ties to, N760S is the only one remaining. If she were a human she'd be the closest yet to achieving immortality. Unlike the others whose parts were probably melted down and reused in other planes and products, N760S pushes on, having escaped the random acts of misfortune which can doom warbirds and vintage aircraft. I especially like the last picture, which feels sedate after her youthful days of buzzing airports and carrying party-goers. Maybe she will achieve something even closer to immortality on this owner's retiring her and be donated to a museum where she can be showcased with the full story of Olive's business jet dream, an end to which I can think of no analogue for a human. Olive Beech was a remarkable woman—hired as an office manager by the nascent and not-too-later non-existent Travel Air Company she would helm Beechcraft after the death of Walter Beech. Surely this is the first example of a woman running an aircraft manufacturer in a field that is, today, still male-dominated. Yet Olive Beech's relative obscurity seems to imply that she lived a life with very little worth remembering. Of course, it's tempting to think that only if I do something that will be remembered through the ages have I done something of note, an assumption we often will admit is wrong, and, often will believe almost simultaneously with the former. The pictures Theresa and I discovered in an antique shop are a window into the lives of people who did not rise to the level of fame as Mother Theresa or notoriety as a serial killer. Let this small post be a tribute to the people whose lives were tied together by this story, the aircraft involved, and Mrs. Beech's attempt to bring the world's first business jet to the US. And, an attempt to answer that question that has haunted people forever: where are the ones who have gone before us?